Had the 8.50 Euro breakfast. A reasonable choice but a little dear. 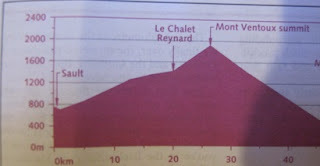 Decided to do another ride from the "Boucles touristiques a velo" leaflet we had picked up on our last visit 3 years ago. This time we selected "the red route on the map "Boucle du Plateau". We left the car at the hotel and cycled 3 milers along the excellent velo route to join the ride at point "J" on the map. The directions we all in Frech but we made our way round the 43 km without too many unintended diversions. We arrived back at the hotel just after 4:15 and then it was a 3 hour drive to Neuillé-le-Lierre and Domaine De LA Roche. Kate estimated our arrive time to be 19:45. We had to check in by 20:00 but made some time up on the Chambre D'hote .The web site did not have full postcode and the address of La Roche turned out to be a collection of 2 large house. Our large scale Michelin map came to the rescue and we rang the bell on the gate spot on at 8:00 pm. We could not remember if we had booked an evening meal. There was a kitchen available for us to use but as we had no food with us our only choice was the Auberge de la Brenne about 1 mile away. They we very busy but did manage to find us a table. The menu terrior was 42e per person! and even one course around 22e. If you missed the cheese course the menu Terriot was a more reasonable 31 e per pesron. The food was very good but portions a little small and we would have like some more vegetables.We severed by the owner who had white linen suit and fake wrap round glasses. I would happy stay there and the price of the rooms were similar to our BB. We got back to the BB just after 11:00 and we able to successfully negotiate the automatic gate. .